In using cryogenic propellants, it was obvious that great care was needed to ensure installation of very efficient insulation at critical points to control thermal losses. In the case of most early rocket technology using LOX as the oxidizer, the problem was not immediate. Designers simply took advantage of the fact that LOX components had a tendency to frost over. The frosty coating worked surprisingly well as natural insulation - so well that many components were designed without insulation from the start. The super-cold liquid hydrogen permitted no such easy design shortcuts. When air touched the extremely cold LH2 surfaces, it did not frost, but actually liquified. As a result, streaming liquid air not only became an annoyance, but also created a serious heat leak. 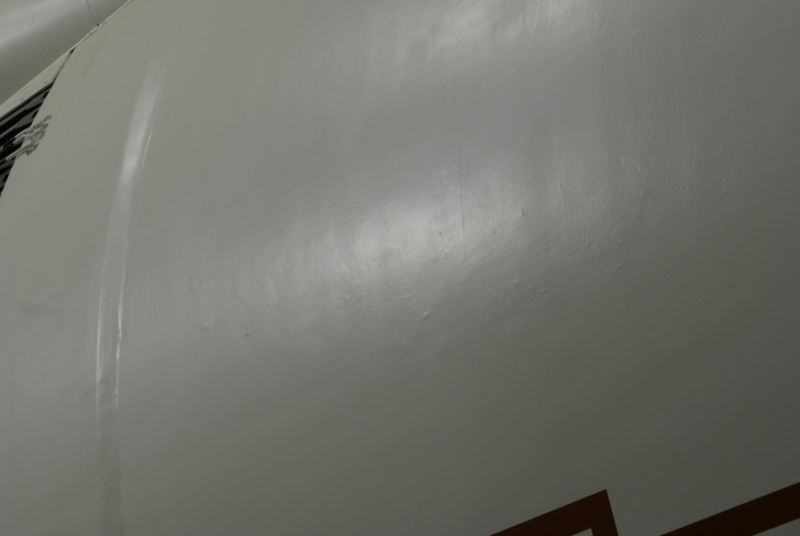 Unlike the S-IVB stage, which applied insulation to the interior of the LH2 stage, North American (the S-II stage contractor) chose to apply insulation to the exterior of the S-II's tankage. Part of the reason for this is that they chose to make the tanks out of an alloy that which stronger at cryogenic temperatures. However, this brought challenges not faced by the S-IVB designers. 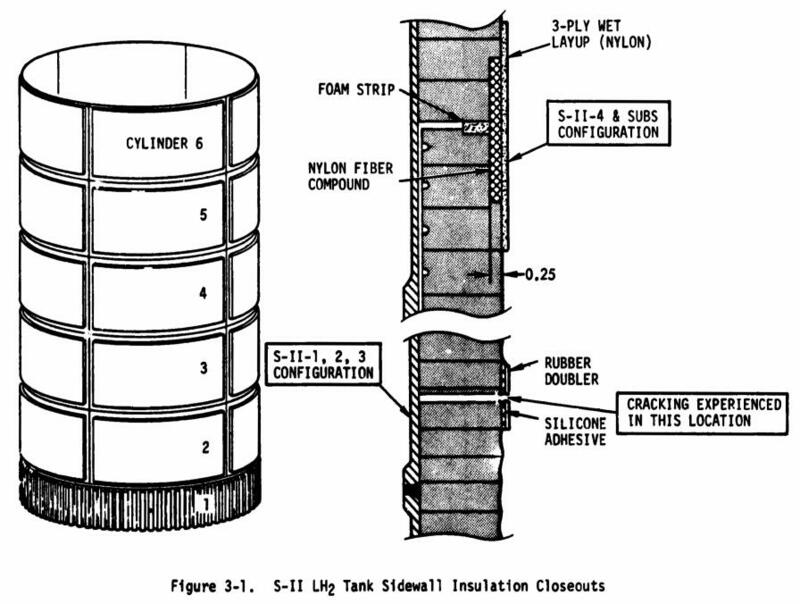 Insulation for the LH2 tank created some of the most persistent technical problems in the entire S-II program. . . . This ... confronted the company with the problem of adequate external insulation and with special difficulties in bonding the insulation to the super-cold surfaces of the fuel tank. The original solution specified external insulation made of phenolic honeycomb filled with a heat-resistant foam of isocyanate. Fabricated in panels, the insulation material was sealed at the top and bottom with a phenolic laminate followed by a layer of Tedlar plastic film. The process of bonding the insulation panels to the tank created potential hazards. Air pockets next to the super-cold metal could be turned into puddles of liquid oxygen; these puddles could eventually weaken the bonding, thereby allowing large panels to peel off. To avoid this, the S-II stage featured a liquid-helium purge of the insulation through grooves cut into the insulation surface next to the tank walls. Helium flowed through the grooves from the start of hydrogen loading through countdown and up to the instant of launch. Unfortunately, this design never worked very well. The purge system was tricky, the insulation bonding repeatedly failed, and chunks of insulation continued to fall off during tanking and test sequences. Although several S-II stages were produced with the original insulation concept, the results were so discouraging that North American spent considerable time and money working up an alternative. Instead of making up panels and affixing them to the tank, the company finally evolved a process for spraying insulation material directly onto the tank walls (eliminating the air pockets), letting it cure, then cutting it to the proper contour. This technique turned out to be much more economical and much lighter than the insulation panels. Note that I could find no additional documentation describing a liquid helium purge, although I found references indicating a "gaseous helium purge" ( Saturn S-II Problem Resolution History Report ) and "helium purge gas" ( Saturn V Launch Vehicle Report AS-501 (Apollo 4) ). Additionally, the "although several S-II stages were produced with the original insulation" is a bit of an understatement: All of the various testing S-II stages as well as the first seven flight stages used the honeycomb insulation. The spray-on insulation debuted on S-II-8 (Apollo 13), and was used for the final six flight stages which actually flew; the two unused S-II flight stages also used the spray-on foam. Structure Conversion to a flame retardant spray-on polyurethane foam insulation on the LH2 tank forward bulkhead, forward skirt, and LH2 tank sidewall areas. To reduce manufacturing costs, effect stage weight savings, improve insulation efficiency, and eliminate prelaunch helium purging and leak detection of these circuits. The Saturn S-II Problem Resolution History Report quantifies this "improved insulation efficiency:": During a ground hold, the LH2 boil-off rate was about 110 lbs. per minute with the honeycomb insulation, while the sprayable foam had a boil-off rate of about 50-57 lbs per minute, depending upon weather conditions. In addition to panel debonding and heat leaks, the honeycomb insulation had an another undesirable trait: the condensation of atmospheric gases within the insulation posed a fire hazard and could explode "in the event of impact, shock, or other stimuli". Of the three surviving S-II stages, S-II-14 at the Kennedy Space Center and S-II-15 at Johnson Space Center (the official visitor center of which is Space Center Houston) are late-model flight stages with the spray-on insulation. S-II-F/D at the U.S. Space & Rocket Center is an early test stage fitted with the honeycomb insulation. 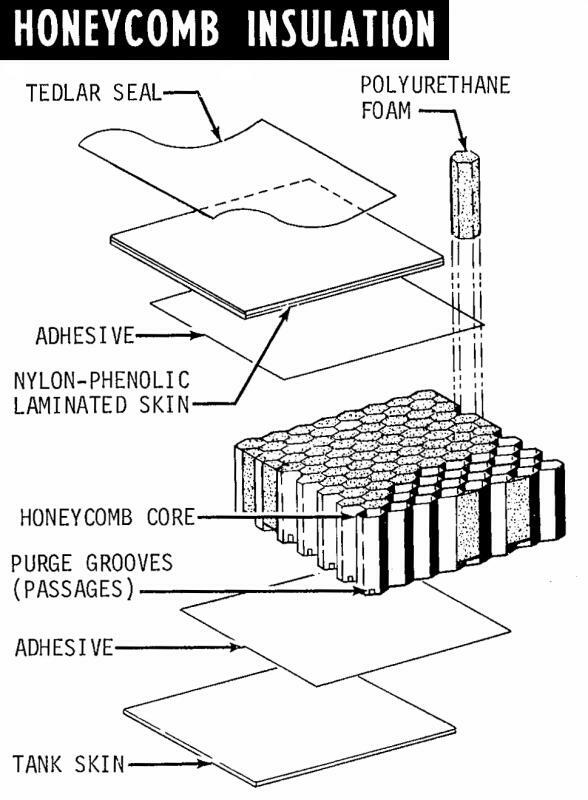 The honeycomb insulation panels were approximately 100 by 300 inches and were composed of 3/4" cells which were 1.6 inches thick and filled with foam (various sources call it either "isocyanate" or "polyurethane" foam). These foam cores prevented convection and were recessed 1/8" to allow purge circulation under the core. The panels were covered with a phenolic nylon outer facing sheet with a Tedlar seal and bonded to the LH2 tank wall quarter panels. Click image for a 969x1318 pixel version of this image in a new window. There was a "close-out" area around the perimeter of each panel over the weld lands which was not covered by honeycomb. This area was filled with bonded insulation strips. A 2-inch-wide silicon rubber tape (RTV 560) bridged the butted joints. Picture MSFC-75-SA-4105-2C shows technicians applying insulation to an S-II scale model; the close-out areas are clearly evident. (The photo's description states that the insulation is being applied to "the outer surface of the S-II second stage booster", but it is clearly a scale model. Two quarter-scale test tanks were made in 1963 to investigate methods of insulating the LH2; I assume this photo is of one of those. 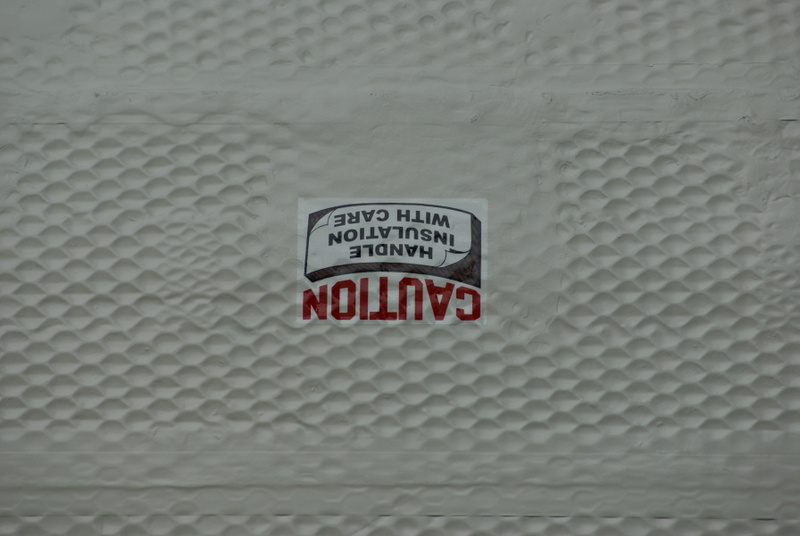 This photo also appears to depict the 0.8 inch insulation panels.) The panel lines and joints are clearly visible on an actual flight stage in photo MSFC-75-SA-4105-2C. Problems with the way the close-out area was insulated exposed the silicon rubber tape to temperatures below its design specifications and led to cracking. After problems with cracking were noted while testing the S-II-4 stage (Apollo 9) at the Mississippi Test Facility, the close-out insulation was redesigned. This change was not retrofitted to S-II-3 (Apollo 8) "because of potential schedule impact and acceptance that the probability of calm wind, high humidity, and low temperatures ... would be minimal at KSC. During the countdown, "numerous cracks developed" in the flexible close-outs, but this caused no serious problems. Click image for a 2518x1900 pixel version of this image in a new window. Originally, the honeycomb insulation was to be only 0.8 inches thick, and the S-II-T (static test stage) and S-II-F (facilities checkout stage, later designated S-II-F/D to also facilitate dynamic testing) stages were manufactured with the 0.8 inch insulation. The thickness of the insulation was increased to 1.6 inches for flight stages to address issues of "stratification of LH2 in large diameter tanks". This increase in insulation thickness added nearly 1600 pounds to the stage's weight and also required modification to the specifications for the linear shaped charges for the propellant dispersion (self-destruct) system. From my S-II (Davidson Center) picture set at the U.S. Space & Rocket Center. dsc49887.jpg from my Space Center Houston picture set.